Lanzarote is strange and bizarre, comparable to a moon landscape. No green areas, just a few trees, plenty of black magma. A brittle beauty, black. Shaped by elemental powers. Serpentines for sport addicts. The fire of the earth created an island of nature miracles. 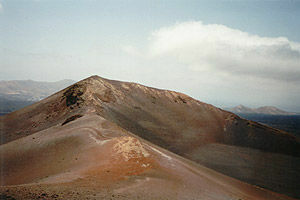 Lanzarote, only 125 km from the African mainland and therefore the most northeastern island of the archipelago, is, with its 795 sqkm the fourth biggest of the Canary Islands. This island leaves nobody unimpressed. Some of the visitors come year after year, addicted to its magnificent charm. Others are shocked by all the rock, heat, solidified magma and the meagre landscape under a burning sun. It is noticeable that under this islands, there boils the volcano  at the moment luckily at a very small flame. It is especially this dryness and brittle landscape that attracts the tourists apart from the beaches and the sea. The senses are provoked by the elemental powers. Fire and water are next to each other. Because Lanzarote is apart from being volcanic, of course, also a beach holiday destination. Unlike in Fuerteventura there are, apart from the foreigners who have their permanent residence here, plenty of people who dont live of the tourism. The natives near the coast are still fishermen and further inland near the white villages one will still find a strange, traditional kind of agriculture. Nowhere else in the world is vine cultivated the way it is in Lanzarote. The vines are grown in funnels of clinker each surrounded by a little wall. The clinker collects the dew and the funnel directs it towards the vines. The hotels are still not high here, the landscape is mostly preserved. The charm of the island is created by a combination of the primeval, volcanic nature, the tranquil life of the natives, the sea and the reasonable way of dealing with tourism. 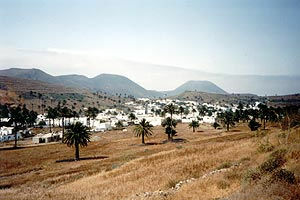 Costa Teguise, Playa Blanca and Puerto del Carmen are the touristic hotspots of this individual island which is biosphere reservation protected by the UNESCO. Despite the fact that the island is only approx. 60 km long from Northeast to Southwest and only 20 km wide from east to west there are still very contrasting landscapes: Endless clinker- and ash fields are covering especially the western parts like the Montaña del Fuego  the fire mountains. These are also Lanzarotes national parks. The south is dry and sparsely populated and very popular with the tourists because of its beautiful golden beaches around EL Papagayo. The centre of the island is famous for its strange vine cultivation around La Geria and disperses in the east into the tourist centres Puerto del Carmen and Costa de Teguise which frame in the capital of Lanzarote, Arrecife. The north around the village Haría is unexpectedly green and sumptuous and forms the agricultural part of the island.